The meeting happened a few weeks after Scott Carson had accepted his new job. In December 2004, Carson ('72 Bus. Admin.) was put in charge of the Boeing Co.'s Commercial Airplanes Group sales team and mandated to recapture the lead in the worldwide airliner market, which had been seized by European rival Airbus. It was a tall task—Airbus had out-sold Boeing in three of the previous four years. To complicate the problem, says Carson, he had to deal with some lamebrain sales procedures installed by a previous chief financial officer. Carson was reviewing the procedures with his top sales executives. He couldn't believe some of the hoops his sales teams had to jump through—each designed to ensure Boeing hit a profit target on every sale by limiting each sales team's ability to cut deals in the field. Carson had been the chief financial officer who had designed the sales process, with the goal of "keeping the sales guys from going crazy." But now the tip was on the other wing. Carson says he looked around the table in disbelief. "Good lord," he said. "What idiot did this?" "My CFO for sales leaned over and said, 'Boss, you did.'" "It was all of the processes that we had put in place," Carson says. "Some of it, frankly, was not necessary. It was embarrassing." But Carson says he learned something: "If you're trying to prevent people from making mistakes, you're making a mistake. It's a lesson for leadership." Carson apparently learned his lessons well. In 2005, Boeing sold 1,002 commercial jets, smashing the previous one-year sales record for the company. Leadership and learning are two big themes for Carson, who in the past decade has become one of Washington State University's top donors. In 2005, he and his wife donated $275,000 to create the Scott and Linda Carson Center for Professional Development in WSU's College of Business. It's goal: to teach graduating students some of the non-academic skills they'll need to succeed in business and to help them make a "graceful and effective transition from the academic world to the professional world," according to Carson. By fall 2006, Scott and Linda Carson will have given more than $1 million to WSU—not including the tuition checks for four of their five children, who have also graduated from the school. They include Kristina ('96 Home Ec. ), Kelly ('99 HRA), Shelley ('04 Bus. Admin. ), and Steven ('06, Bus. Admin.) A fifth child, Sandi, graduated from University of Washington. He and Linda were glad to do it, Carson says. WSU, he says, literally changed his life. Carson grew up on Mercer Island, the son of a Boeing test pilot. "I always knew I wanted to work in aviation," he says. "For those of us growing up in Seattle, that meant Boeing." Carson went to summer school to get his aviation mechanic's certificate, but studying was never a priority, he says. "I wanted to work on planes and avoided studying." He served two years in the U.S. Air Force in Vietnam as a staff sergeant and an armament crew chief in a special operations unit. He "loaded ordnance during the daytime, and kicked flares from transport aircraft at night." After finishing his tour of duty, Carson came home and worked for a time at Boeing, only to be laid off during the "Will-the-last-person-in-Seattle-please-turn-off-the-lights?" layoffs of the early 70s. He also met Linda, who made one thing perfectly clear, Carson says. "She insisted that any serious intentions in our relationship had to be accompanied by a college education." WSU, he says "was kind enough to admit me." So Scott and Linda got married, packed up their belongings, drove to Pullman, and enrolled. They moved into a little house on Wayne Street, he recalls. "At the time, it was the last civilization before the wheat fields." On the edge of that wheat field, Carson, who'd never been much interested in school, "discovered that I really enjoyed learning and actually turned into a fairly good student." The experience "helped me to realize that I had some potential as a student, and a person." Carson hasn't forgotten that. A corner of his office at Boeing's Longacres Park headquarters is a shrine to WSU memorabilia, and he has a custom-painted crimson-and-gray Shelby Cobra with a "Cou-bra" vanity plate that he drives at WSU homecoming and other events. 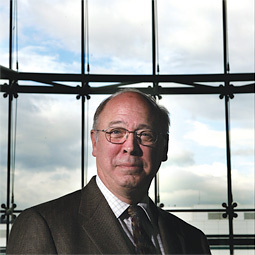 Carson's a trustee of the WSU Foundation, and is Boeing's executive liaison to the University, which helped him steer a $99,000 grant to help create a wireless classroom at WSU. After graduating with a bachelor's degree in business, Carson took a job with Safeco, selling investments. It was his first sales experience, and it involved a lot of cold-calling, he says. "I didn't particularly enjoy that." In 1973, he went back to Boeing as a financial analyst, this time to stay. Selling jets to airlines is a unique occupation. The deals often are worth billions of dollars, and a particularly big one can sway the U.S. balance of trade. Boeing and Airbus sales teams often negotiate with key officials from governments that own national airlines. For most of this decade, the field has been dominated by John Leahy, the American-born supersalesman for Europe's Airbus SAS. Leahy is known for his patrician looks, French cuffs, and tenacious, deal-closing pitches. Carson, on the other hand, is "the antithesis of the brash Leahy," according to Leeham Co. analyst Scott Hamilton. "I'm not an over-the-top, pushy sales guy, and that's where he [Leahy] seems to come from," he says. "I actually like John, but he can be a bully sometimes when he closes a deal. That's not very Boeing-like, and it's certainly not very Carson-like." Instead, Carson says his approach is team-oriented and strategic. To compete with Airbus, Boeing has loosened the leashes, Carson says. Instead of having to run proposed deals past Chicago headquarters—like a rookie car salesman conferring with the sales manager—Carson's team has more authority to make deals in the field. Before they meet with a customer, they discuss what Airbus is likely to offer, and build their sales pitch around that, Carson says. As a result, when Airbus offers to cut its price, the Boeing team has already been cleared to make a counteroffer. "It allows us to be more nimble," Carson says. "We're asking for what we need once, instead of four or five times. All of that has freed the guys up," he says. "We're getting better-quality deals, so everyone wins." Carson's strength, according to Larry Dickenson, Boeing's vice president of sales for Asia, is in helping his sales teams prepare and win sales campaigns. Dickenson has been in his job for more than 20 years, and says Carson's the best sales chief he's worked under. "I only wish I had had this relationship earlier in my career," he says. Carson's career has taken him full circle. In 2005, he returned to Vietnam, leading a Boeing sales team. "I'd never seen Hanoi from the ground," he quips. "The last time I was in Vietnam was in vastly different circumstances." Carson says the one great lesson is that companies need "processes that support people," and not people who know how to work the process. "People will never learn if you don't give them enough rope," he says. "Don't try to avoid every mistake scenario." After not quite two years on the job, the industry perception is that Carson seems to have succeeded in changing Boeing's sales culture, said Paul Nisbet, an analyst with JSA Research in Rhode Island. "They're being much more customer-attentive than what they've done in the past, and they're not quite as arrogant." Teal Group analyst Richard Aboulafia in Virginia describes the sales effort as "aggressive and confident" and "less obsessed with making every deal make the numbers." "They've got wind behind them," Aboulafia concluded. "And a great sail."